I got an odd error when developing a simple workflow in MOSS with WF the other day. Our workflow was simple enough, we were adding tasks then sending out alert emails once it was initiated then sending out emails on completion. All fairly straight forward although the email was sending even though the debugger was telling us that all code was being run. As usual MOSS was being extremely helpful with the error message “Error Occurred”. Taking a closer look at the MOSS logs under “C:\Program Files\Common Files\Microsoft Shared\web server extensions\12\LOGS” we found that this error had occurred “Correlation value specified does not match the already initialized correlation“. 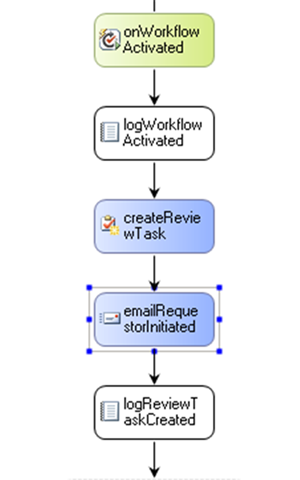 The problem was that we’d used the same CorrelationToken through the whole workflow, but email task need a different token to the Create/Delete Tasks. I’m not sure why this is the story but I’m going to look into it a bit further over the next few days and get deeper into how the WF architecture works to actually get a reason for this, but in the meantime if you have the same problem here’s the quick fix for you.